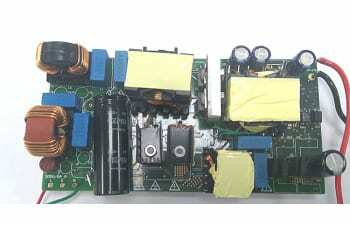 The TIDA-010028 reference design from Texas Instruments (TI) is a compact, high efficiency, bridgeless 330W, 19.5V output ac-dc reference design. This design consists of a front-end, bidirectional bridgeless boost power factor correction (PFC) based on the UCC28180A device, achieving end-to-end peak efficiency of >94% at 90Vac input and >95.5% at 230Vac input. The dc-dc is implemented using the HB-LLC stage implemented using TI’s UCC256301 device. The design uses the UCC24624 device for synchronous rectification at the secondary side to improve efficiency. This reference design is targeted at consumer and industrial applications. With a growing trend to increase the power density and higher efficiency, the overall losses in the power supply need to be significantly reduced. This brings out the need to adopt bridgeless PFC topologies and soft-switched isolated dc-dc power stage. Bridgeless PFC topologies eliminate the conduction loss in the input diode bridge, which forms a significant portion (up to 2%) of the losses in the ac-dc power supply at low input voltages from 90- to 140-Vac. This design consists of a bidirectional bridgeless CCM boost PFC which operates from an input voltage range of 85- to 265-Vac RMS with efficiencies >97% at 90Vac input. The second stage is made up of an isolated half bridge LLC stage which generates a 19.5V, 17A nominal output with approximately 97.2% efficiency. This design demonstrates high efficiency operation in a small form factor (152 × 75 × 25 mm) and delivers continuous 330W of power over the entire input operating voltage range from 85- to 265-Vac. It gives an efficiency of >95.5% for 230Vac nominal operation and 94% for 90Vac nominal operation. The CCM PFC stage is controlled by the UCC28180 fixed frequency PFC IC. Additional circuits to implement the bridgeless topology using the UCC28180 have been incorporated. The HB-LLC power stage is controlled through the stage of the art UCC256301 resonant controller which implements current mode control for increased control bandwidth. This increased control bandwidth reduces the output capacitors required to suppress the ac ripple on the output. To achieve high efficiency, the output of the LLC stage uses synchronous rectification based on the UCC24624 IC and the CSD18533Q5A MOSFET. The following highlighted products are used in this reference design. Key features for selecting the devices for this reference design are explained in the following sections. To implement the high-performance CCM PFC, the UCC28180 is the preferred controller because it offers a series of benefits to address the next generation needs of low THD norms for power tools. The UCC28180 is a high-performance, CCM compact, 8-pin programmable frequency PFC controller. Its wide and programmable operating frequency provides flexibility in design. Its trimmed current loop circuits help achieve a less than 5% THD from medium-to-full load (50% to 100%). Reduced current sense threshold helps use a 50% smaller shunt resistor, resulting in lower power dissipation while maintaining low THD. In this design, the UCC28180 is used to implement bridgeless CCM PFC with some modifications to the input current sensing, gate driving and external burst mode logic to further reduce the standby power consumption. LLC resonant converters are one of the most widely used topologies for implementing medium-to-high power isolated dc-dc power stages in industrial power supplies. These converters are popular due to their ability to achieve soft-switching (ZVS turn-on) for the high-voltage MOSFET, improving he overall efficiency of the system. LLC converters in industrial power supplies do face some specific requirements. Some industrial power supplies need to support an overload (up to 1.5 times the nominal load) for a short period of time. The LLC converter must not enter the capacitive (ZCS) region during the overload operation; otherwise, it can be catastrophic. With its ZCS avoidance feature, the UCC256301 can ensure that the system does not enter the ZCS region under all operating conditions, keeping the system safe. The UCC256301 provides a wide operating frequency range from 3kHz to 1 MHz to make it easier to design wide output voltage range using an LLC converter. The UCC256301 with its unique hybrid hysteretic control provides excellent line and load transient response, minimizing the need for output filter capacitors. Its wide frequency range can be used to reduce the PFC bulk capacitor required to meet the holdup time requirement in the industrial power supplies. With the integrated high-voltage gate drive, Xcapacitor discharge function, and addition output overvoltage protection, the UCC256301 reduces the amount of external discreet components required to implement a high-efficiency industrial power supply. The UCC24624 high-performance synchronous rectifier (SR) controller is dedicated for LLC resonant converters. Two independent SR control channels with interlock to prevent shoot-through are integrated into the single package to minimize the external components and allow for easy PCB layout. With low standby current of 175µA and automatic standby mode detection, this part reduces the overall standby power consumption of the system. The is a 4.7mΩ, 60V, SON 5 × 6 mm NexFET power MOSFET with ultra low Qg, designed to minimize losses in power conversion applications. In this design two MOSFETs are used in parallel to replace each output diode.